As I reflect on this passage, the psalmist's encouragement is for us to be able to sing our own song of praise to God. We have found ourselves increasingly able to do this as we reflect upon the countless ways we have seen God acting in our lives. Of the many ways he has shown himself faithful to us, caring for us, and being our tangible strength, help and shield, I will limit myself to two in this update. The first has been your faithfulness to us throughout the six years of ministry at the Capitol. Because of this faithfulness of friends and partners like you, God has grown my confidence in him, and is allowing us to serve in a unique way in this meaningful and important work. Without your prayers, encouragement, and sacrificial support what we are seeking to do would simply be impossible. So, Thank you again for your prayers and ministry partnership! The second is making available to the ministry a new booklet from Dallas Willard Ministries titled, Called to Business. In the new year we will use this material as a way to connect and bless our legislators, staff, lobbyists, local churches, and those in business. Below is a statement from Dallas Willard Ministries announcing this partnership. Dallas Willard has long been an eloquent voice for the dynamic power of God in every aspect of our daily lives. His emphasis on the importance of our jobs as a means of bringing value and goodness into the world is of vital significance. 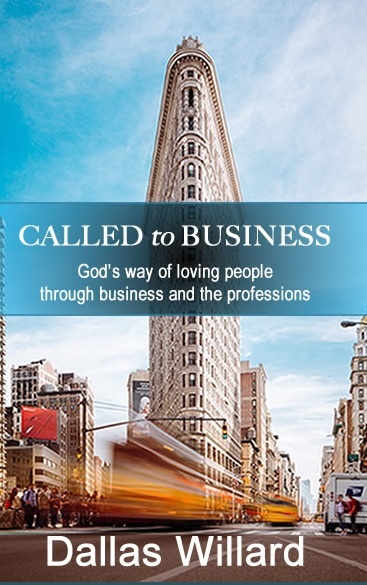 So we at Dallas Willard Ministries are grateful for the opportunity to partner with Jeff Whitebread and Capitol Commission in bringing you Called to Business, a collection of Dallas’ only three written essays about work accompanied by two papers that were foundational in his teaching on the subject. Dallas believed that our work is of central interest to God in its role as a fundamental part of our lives. He understood the significant impact business has in shaping our culture, and taught that responsibility for the condition of the world in years to come rests upon Christian leaders because they alone have at their disposal the resources and means of God’s kingdom to bring their surroundings increasingly under the rule of God. We’re delighted that you are receiving this booklet. May God use it to bring you a clearer vision of the never-ending life in God's World before you, and of the everlasting significance of your work day by day. As we reflect on Christmas, we see that God so loved that he gave. For God so loved that he sent. Love took the shape of giving and sending. In the same spirit of love, we are excited to give those who’ve financially partner with us a copy of this new collection of Dallas writings on work. For others who would be interested to receive this gift, please contact me via email with your mailing address and we will gladly send you a copy. Please consider my giving you this booklet as an invitation to further engage with you in exploring the material presented by Dallas. And, please pray for its impact at the Capitol in the years to come. If you would like to make a contribution during this Christmas season to this work, click here to do so.